In the case of dengue virus, most researchers believe that this enzyme lands onto the 5´ end of the viral genome, jumps to the other end (3´), and then begins copying. In a new study published in the Journal of Biological Chemistry, the research group of Sarin Chimnaronk refutes this view, eliminating the need for the “jumping” step. This work identified an RNA motif of “ACAG” being caught by the RdRp. This mechanism most likely applies to many other RNA viruses, including Zika, West Nile, Yellow Fever, Japanese Encephalitis, and more. Naturally, a clearer picture of the self-copying process should better enable researchers to design effective drugs for these diseases. 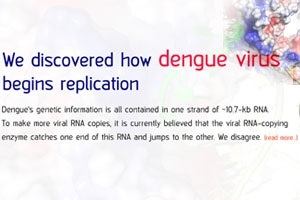 Interaction (in green) between the RdRp enzyme and the ACAG code in the viral genome is necessary for initiation of dengue virus replication. Hodge K, Tunghirun C, Kamkaew M, Limjindaporn T, Yenchitsomanus PT, Chimnaronk S. (2016) Identification of a conserved RNA-dependent RNA polymerase (RdRp)-RNA interface required for flaviviral replication. J Biol Chem. 291(33), 17437-49.